Our very first visit to Sushi By Bou was in Dec 2017. We were instant fans! For the next 2 months, we visited 3 additional times. Clearly, the quality and value prevailed. 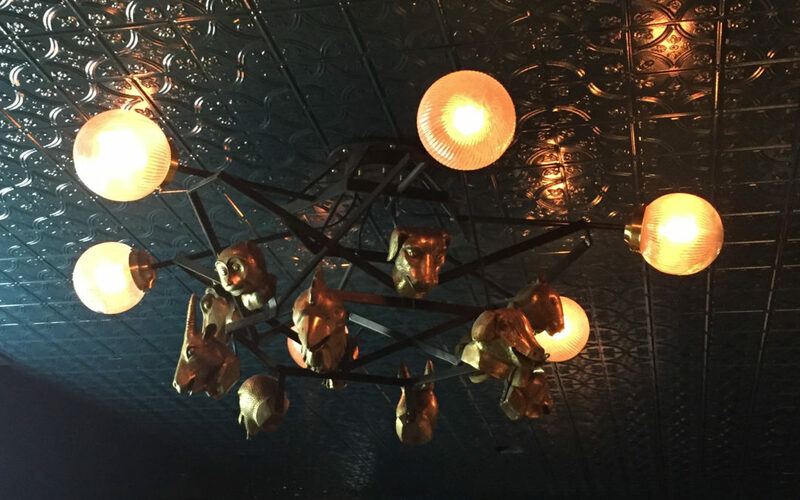 I made a promise to myself to not continually write new postings on restaurants we’ve already written about, UNLESS something’s changed. Well… I’m going to be breaking that promise today, but won’t hereafter. Ha! 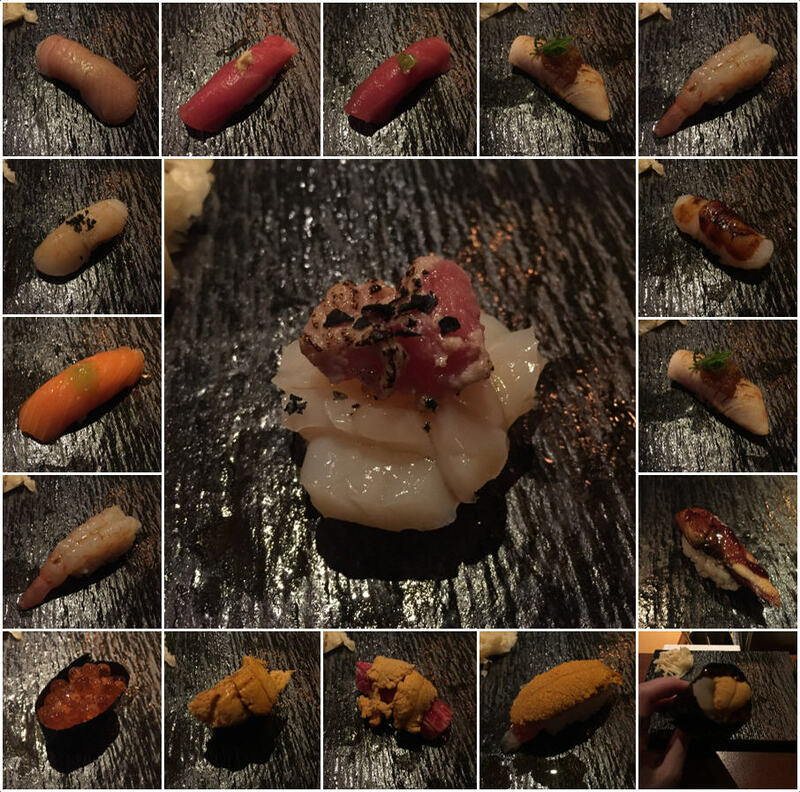 I felt a need to write one more time, to share that we’ve had four incredibly consistent meals and experiences at Sushi By Bou over the course of 2 months. 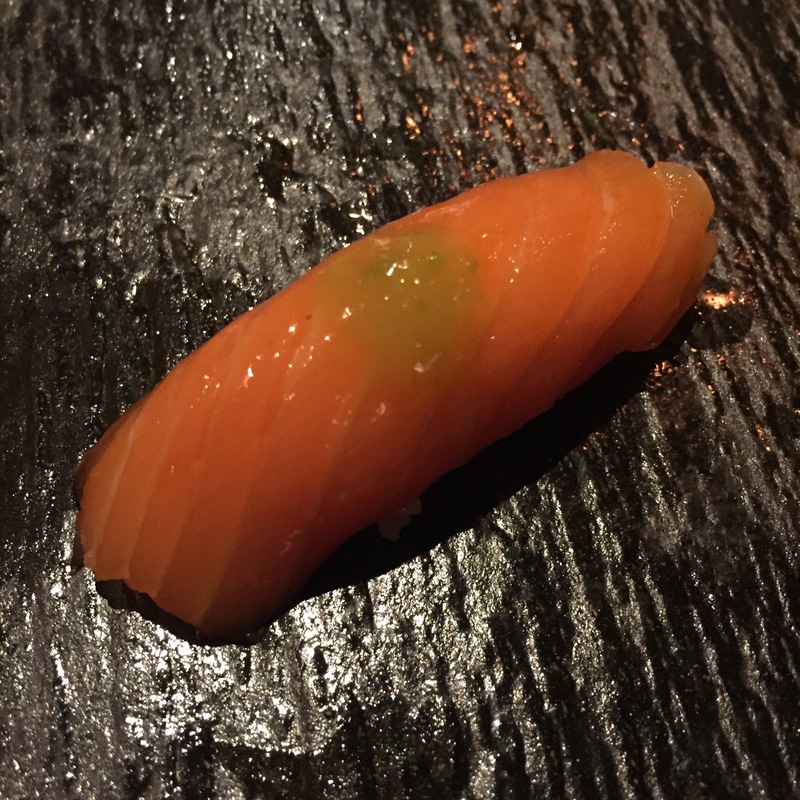 They are by far, the most “stable-staple” sushi-ya in NYC, which sounds limiting, but continue reading, and you’ll understand why they are worth the visit. 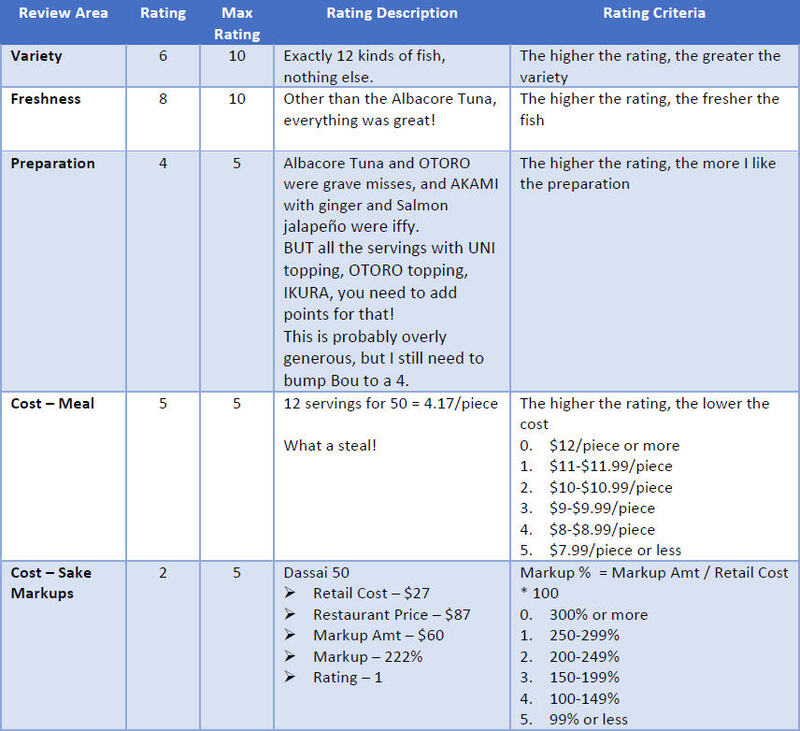 They are great with the basics, fish that is widely available in North America, thus good every single day of the week! 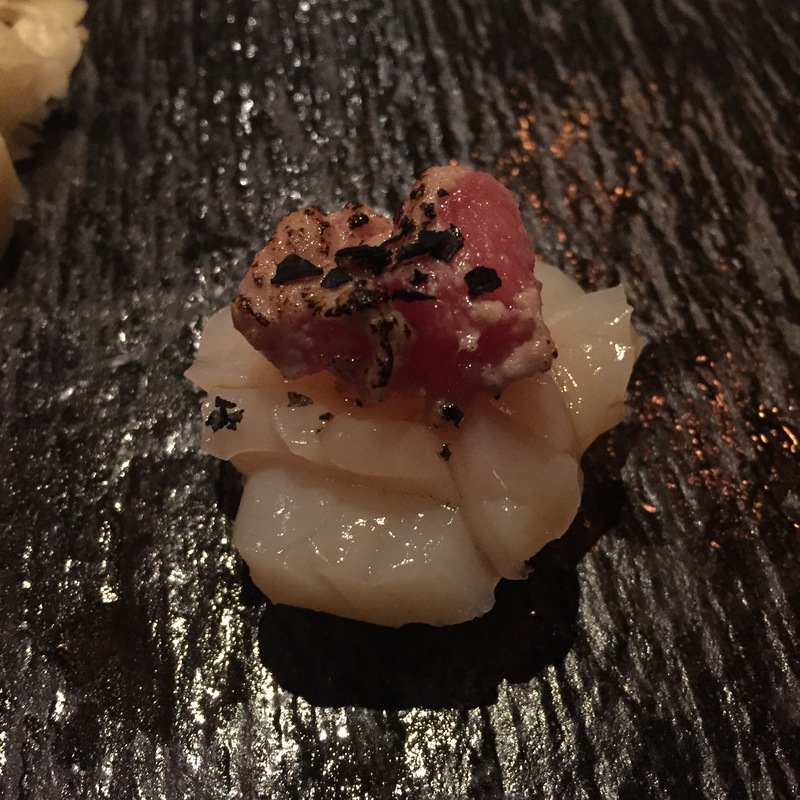 You won’t ever find anything exotic, any “special” Japanese fish, but their basics: Salmon, Yellowtail, Tuna, Scallop, Shrimp, and even Sea Urchin and Wagyu, they got it down! And beyond any realm of comprehension, Bou continues to secure and serve up incredibly high quality Santa Barbara UNI. Bae, the costlier counterpart sharing the bar, does serve up pricier Hokkaido UNI, but quality is not nearly as good. Despite my extreme affinity to whites, silvers, and shellfish, I am perfectly satisfied with a full meal purely out of Bou’s basics. Plus, the staff, usually consisting of just 2-3 chefs (third chef includes Bae), the host, a bar tender, and a bus “boy”, serving 8-12 patrons, is truly the most pleasant bunch! 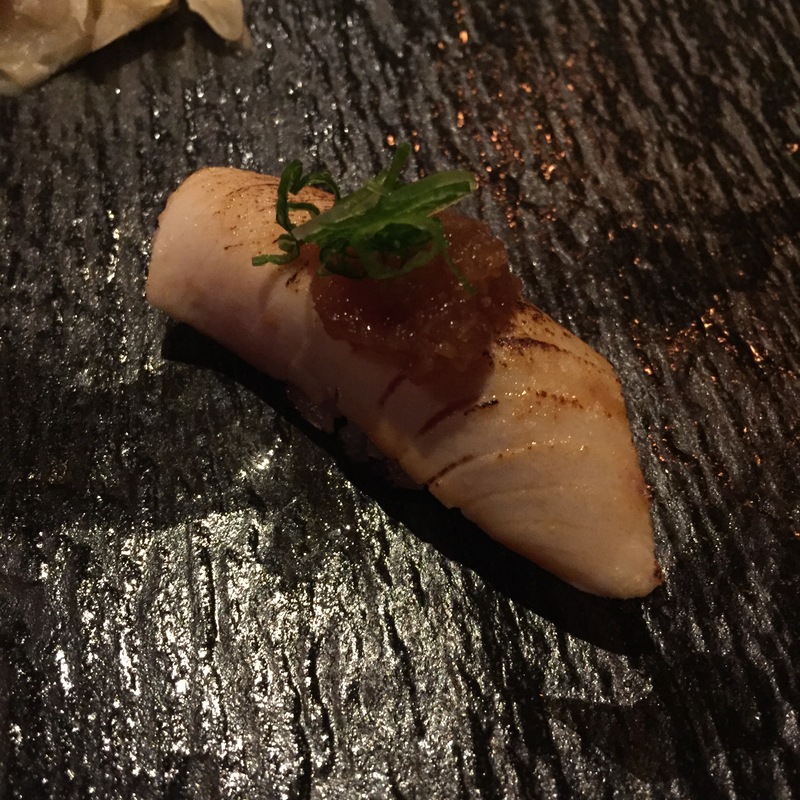 HAMACHI (young yellowtail) – The most basic of Yellowtails. Nothing special in terms of sourcing, wild vs farmed, and not even a belly. For its varietal, very good! 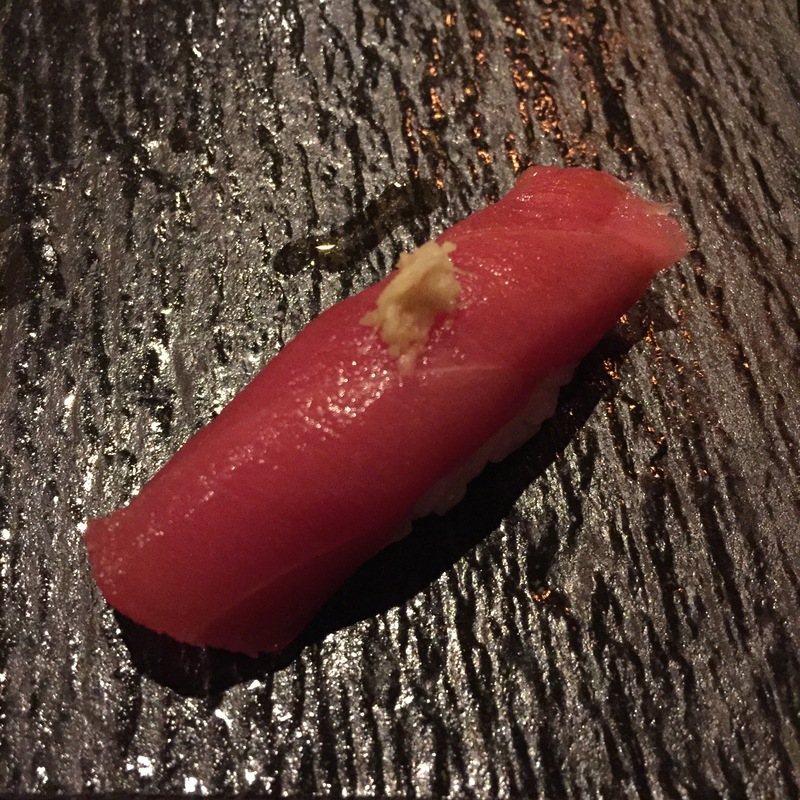 AKAMI (lean Bluefin Tuna) – Topped with ginger. Great AKAMI, but serving itself was just good… I prefer ZUKE (marinated) over the ginger topping. 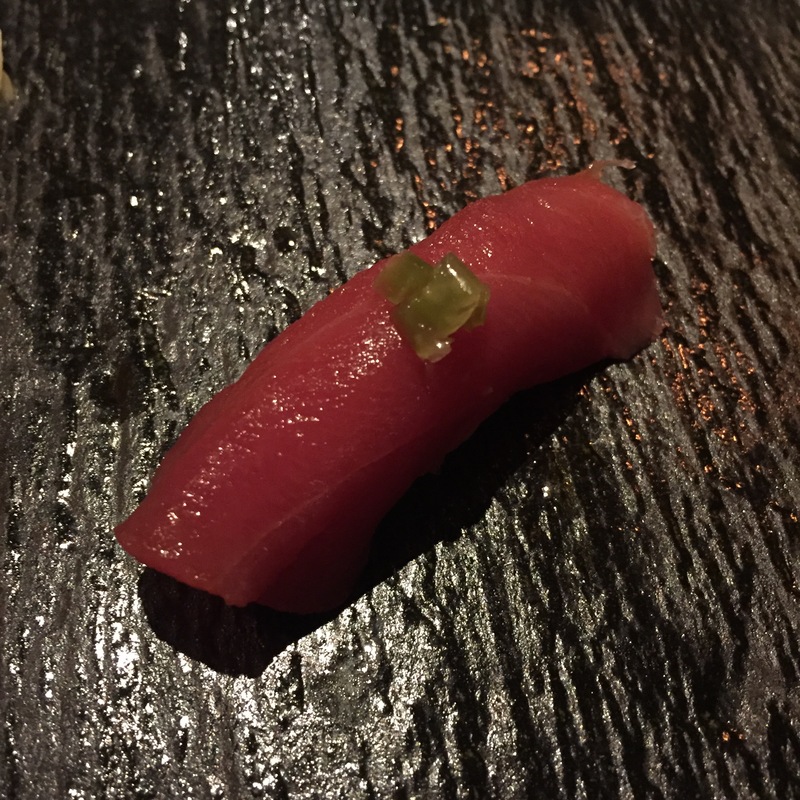 AKAMI (lean Bluefin Tuna) – Topped with Jalapeño. Same great AKAMI, and decent serving, better than the ginger. Still prefer the ZUKE, but will take this over just plain AKAMI with soy. 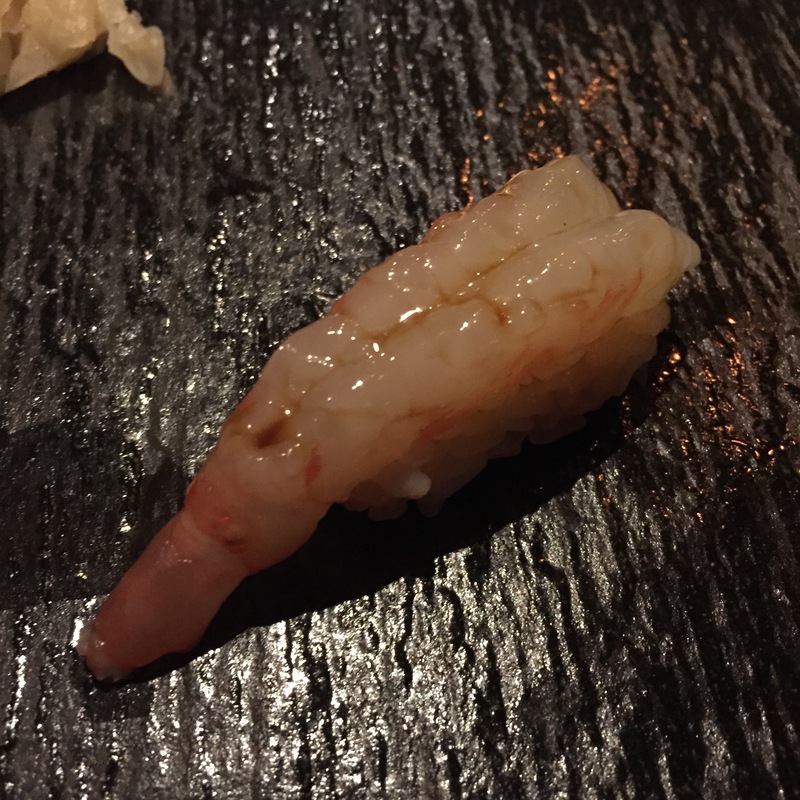 BOTAN EBI (Sweet shrimp) – Very, very nice, love the simplicity of a lovely BOTAN. DELISH! 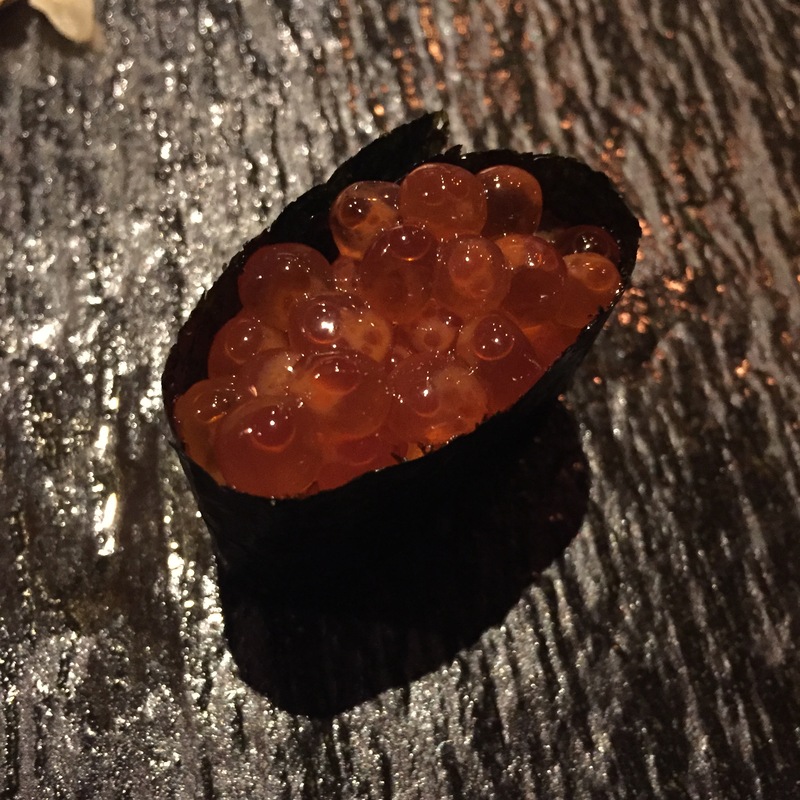 IKURA (Salmon Roe) – Lovely marinated little pearls, fully intact, perfectly round and uncrushed! 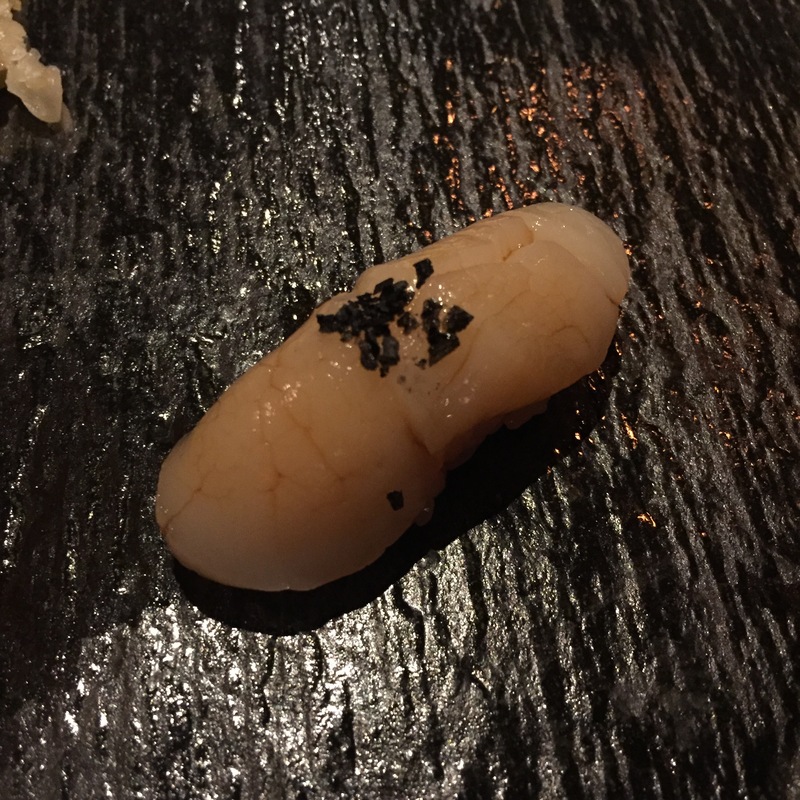 HOTATE (Scallop) – Again, nothing out of this world, nothing I would sit at home and reminisce, but pretty darn good. 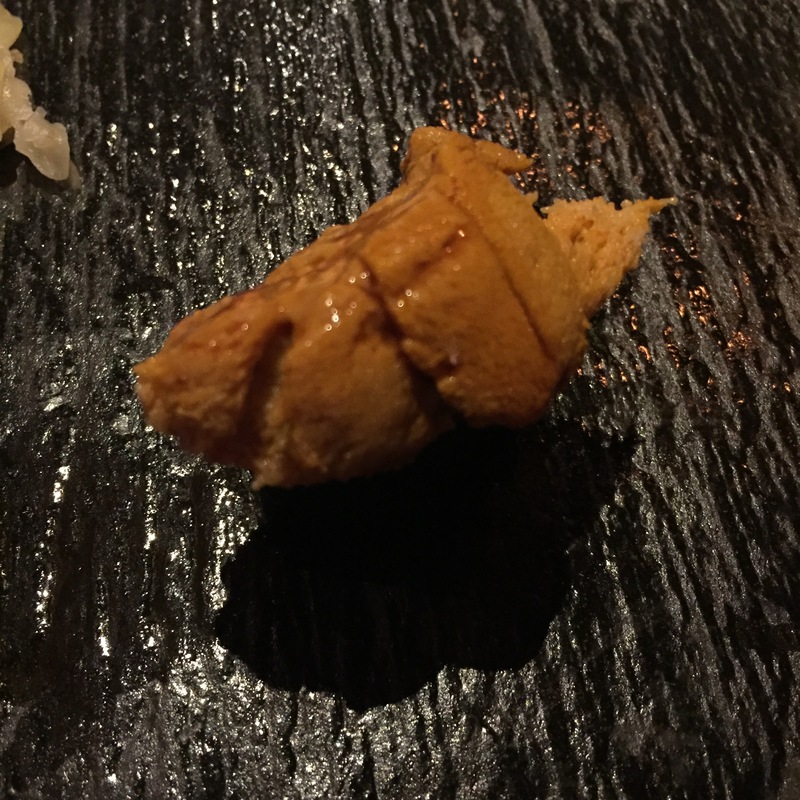 UNI from Santa Barbara – As I stated in the opening, Bou has great UNI! Wonderful! Scrumptious! Encore!!! 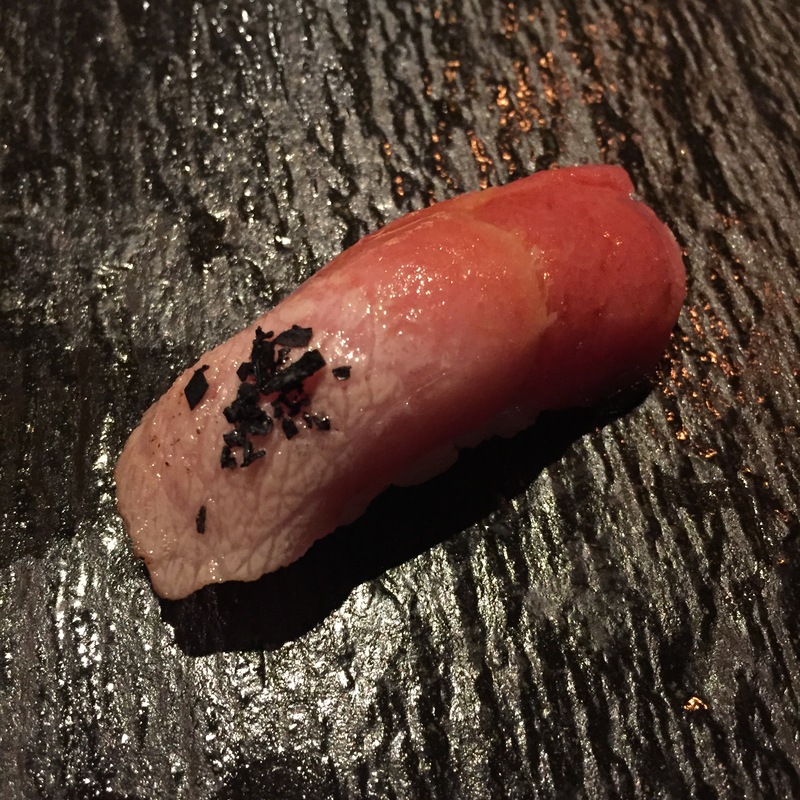 OTORO (super fatty Tuna) – The fish itself was fine, perfectly good. The serving was a flop to say the least. Perfectly decent and good cut of OTORO, wrecked by half, semi-ABURI-ing (torching), and then layering of crazy black sea salt atop. Ugh! No! Wrong! All wrong! Leave the fish alone, and just top it with some soy! Or if you feel an irresistible urge to fire up the blow torch, torch, then top with something that will cut the fat, perhaps a grated radish or sorts. What are you thinking??? Salmon topped with jalapeño sauce – Salmon with farmed, and fatty – just the way I like it. The jalapeño sauce was unnecessary, didn’t enhance, but also didn’t distract. 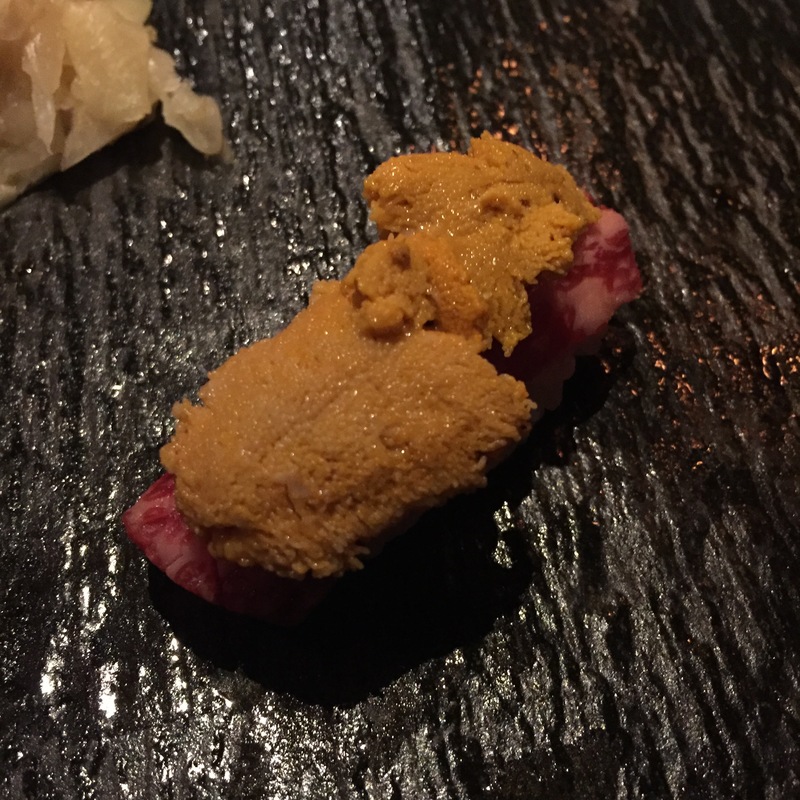 Wagyu and Santa Barbara UNI – The same fantastic UNI atop a super fatty piece of raw wagyu (we asked for it not to be torched). This alone is worth the visit! 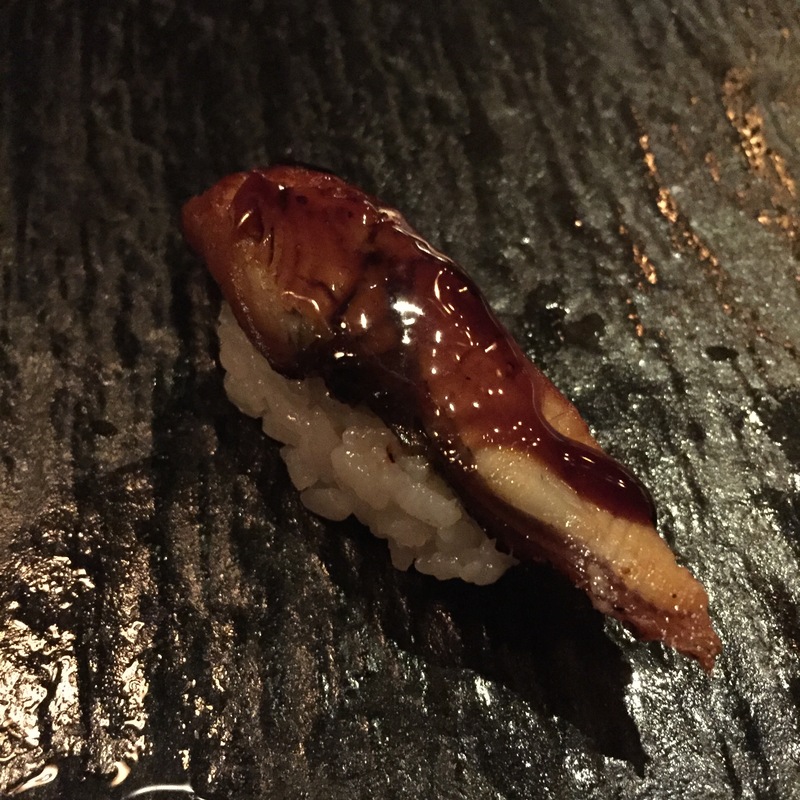 UNAGI (Eel) – Yuck – but again, for 50 bucks, you can’t demand the world. 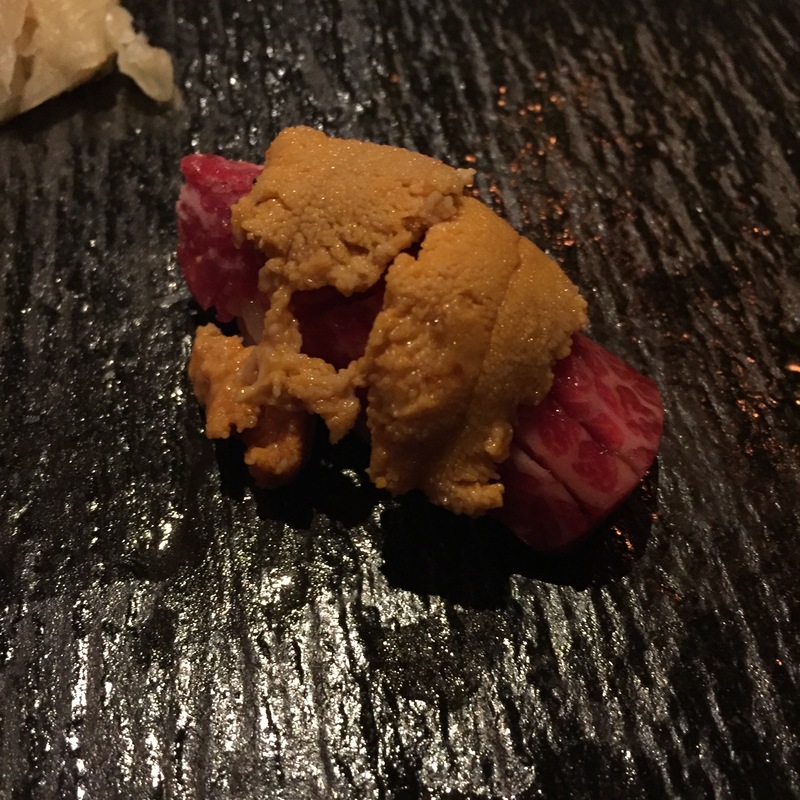 Wagyu and Santa Barbara UNI – Of course! We had 2 more after this too! Don’t judge! 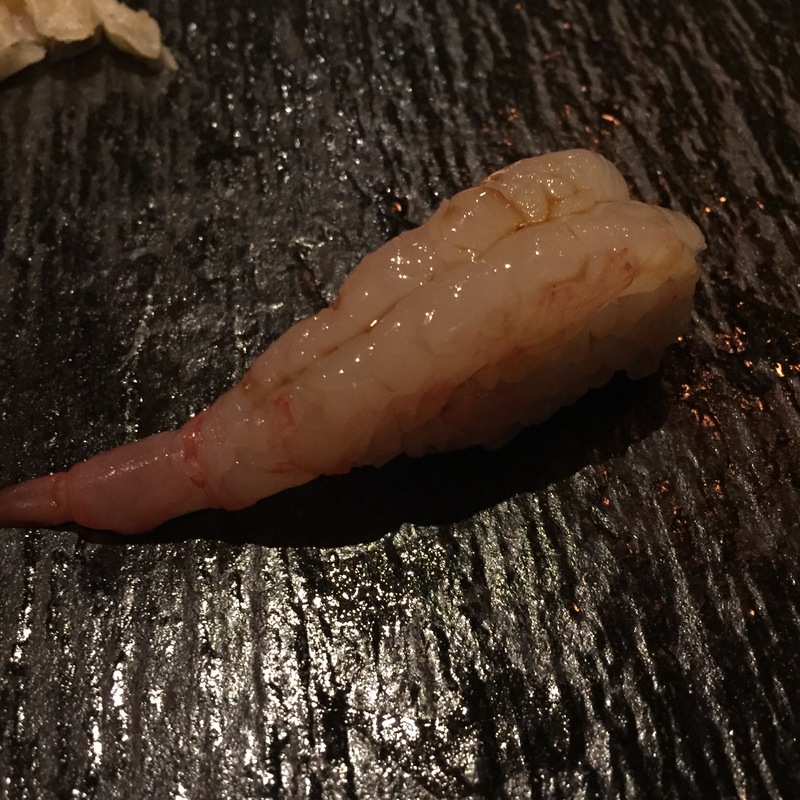 BOTAN EBI – Worth a repeat. HOTATE with OTORO ABURIed and topped with sea salt – I’m not being wishy-washy with my preferences, not at all. 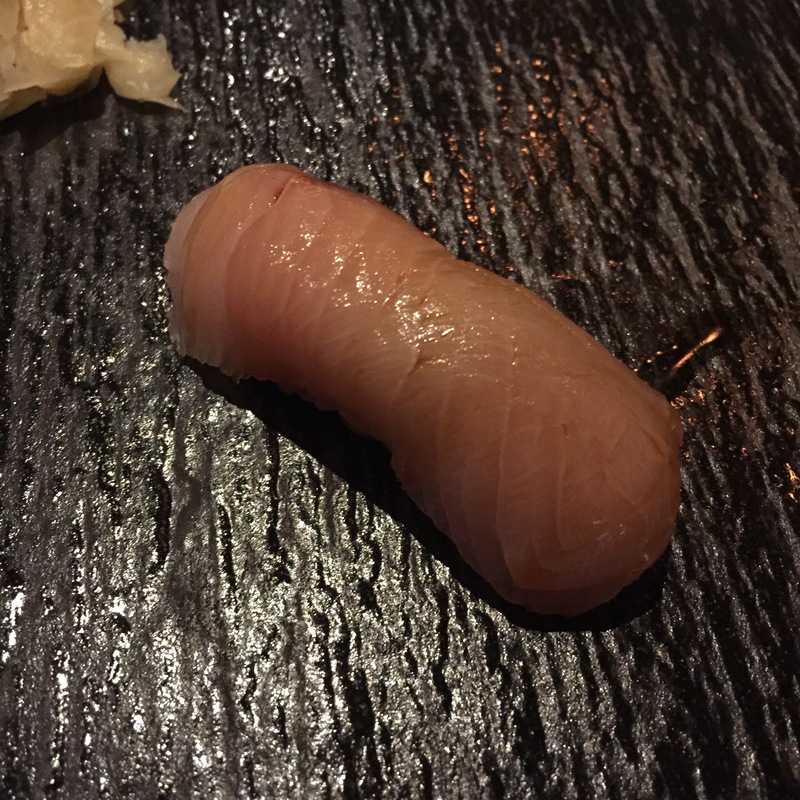 If you’re going to pair my OTORO with HOTATE, which cuts the fat, I am OK with the slight torching AND the sea salt! 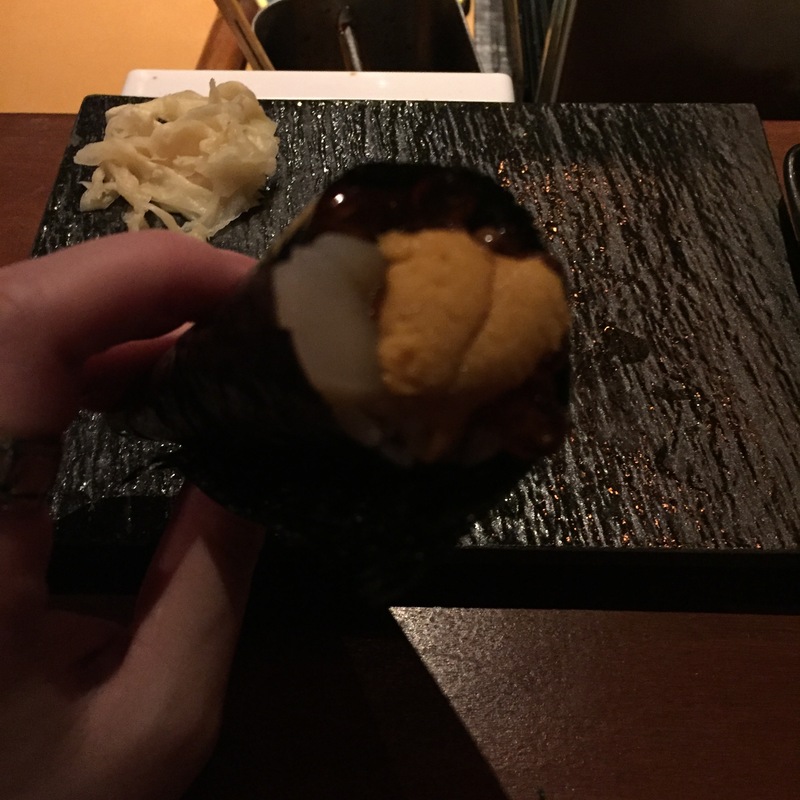 HOTATE, UNI, IKURA handroll – Beyond words. Impeccable! 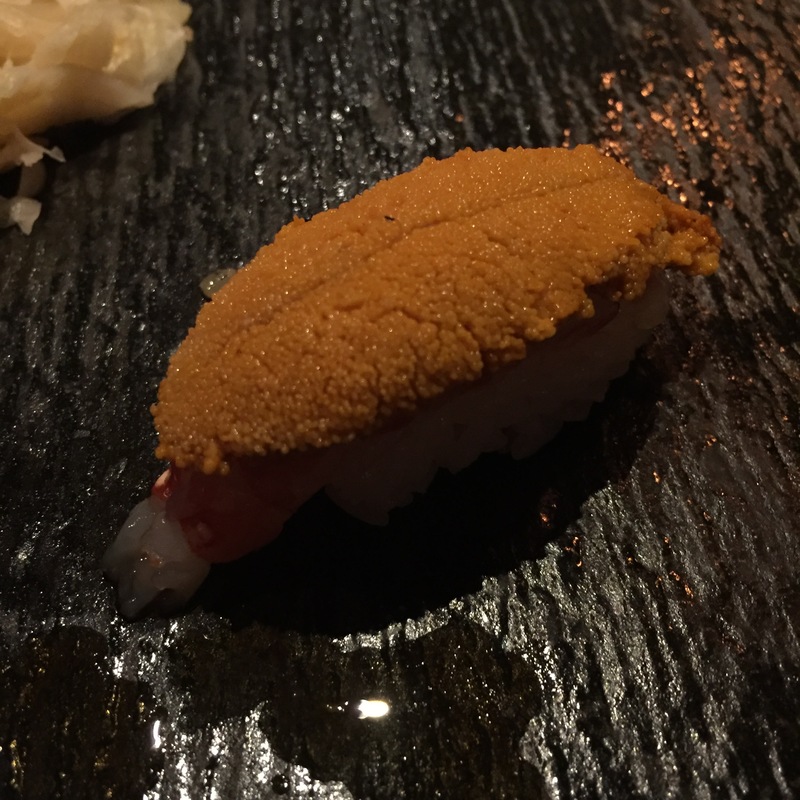 BOTAN EBI with UNI – Check that UNI serving. Get out of town! What isn’t great with some first grade UNI??? I anticipate coming back again, and again, and again. But I promise to not write a million posts, only if something changes.